Having a reliable service jack in your car can save your car from running with a flat tire. On the other hand, having a jack stand can save you (literally) from freak accidents such as… Errr, being “flat”. Kidding aside, hydraulic lifts and service jacks serve ONLY to lift your vehicle, and nothing more. Keeping them still and supported while being suspended is a different story altogether. And that’s where this “steady” car tool comes in. 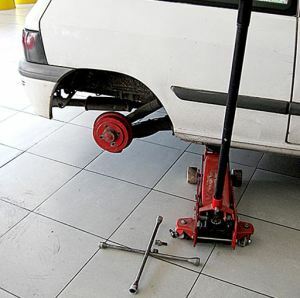 A jack stand is a device that is being used to hold and support a lifted automobile’s weight (such as cars, houses, etc.) firmly and securely, as it withstands the load to make it stationary once it has been properly placed, sat and clamped on the object’s holding point. Be safe when going underneath the car. Use jack stands. Jack is for lifting. Jack stand is for holding. Perhaps, it is safe to say that jack stand is one of the most underused, underrated and probably taken for granted tools. Given that most auto-mechanic garages and repair shops have these bad boys on the sideline. As for some, if not most car owners, they tend to ignore this merely because they already have purchased a jack. 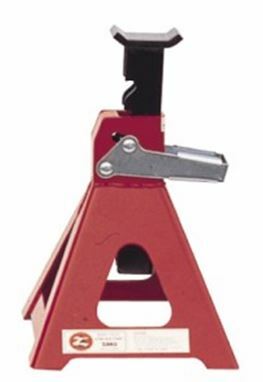 It is a common misconception and a bad practice for most motorists to go for the hydraulic lift or scissor jack to serve them well by means of employing it as a jack stand as well. Little did they know that it is pretty dangerous to use hydraulic jack alone to hold and support their cars while being lifted and suspended. Regardless of the weight buffer and limit, this practice could cause serious injuries, not to mention significant car damages, if blatant misuse is encouraged. What makes a jack stand safe? Jack stands are usually equipped with a self locking system (ratchet or screw locking system), which will be the main feature in holding and securing the car’s load once it has been positioned. The stand’s steel-welded tri-leg form factor also plays a big role in supporting and distributing the car’s weight, which will prevent the vehicle from toppling and wiggling. 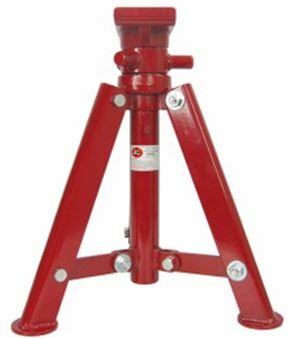 And aside from the self-locking functionality, some jack stands also include a separate screw, pin or wedge to insert into a hole to double the assurance of safe use. But mind you, jack stands can still bring some serious damage to your car if it is not properly used or positioned. Always make it a point to find the car’s sweet spots for lifts and stands. In relation to this, make sure that you’re on a relatively-leveled surface when lifting a vehicle and securing the stand. Never lift your car in an uneven surface, as it may cause your car to move/run accidentally. And speaking of accidental tire movement, tire chocks and wedges are also important to prevent the wheel from moving/spinning. Just to be on the safe side, remember to pull the handbrakes/park brake when necessary to enforce safety and worry-free car repair. And of course, to guarantee tough, outlasting and enduring tools for your industrial and automotive requirement, visit ABest Industrial Supply’s official website and check out some of our line of heavy-duty hydraulic tools, as well as power kits, pneumatic and mechanical devices.